The McLaren 570S GT4 has been the car to have all week in Daytona for IMSA Michelin Pilot Challenge teams. The BMW Endurance Challenge at Daytona on Friday (Jan. 25) was no different. 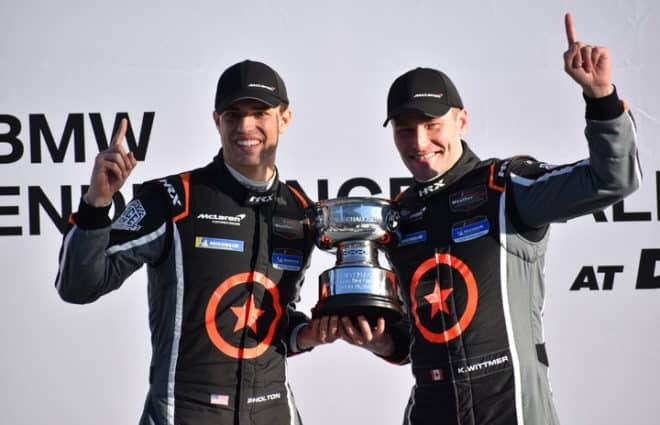 Paul Holton and Kuno Wittmer started from pole, led early and often, then recovered from a penalty to take the overall victory. Holton got a huge jump at the start of the race, then gave that advantage up to Multimatic Motorsports’ Ty Majeski, then got it all back in the first lap. From there, Holton attempted to open up a big gap on the field. That was ultimately stymied by the first of nine full course cautions. The first yellow came out when Rebel Rock Racing’s Frank DePew spun and hit the wall in his Chevrolet Camaro GT4.R exiting the Kink. At the same time, BimmerWorld Racing’s Kaz Grala cut his right rear tire, just the beginning of a tough day that would see the Xfinity Series competitor and Aurora Straus finish 30th in class as the last car still running. During the race, Compass Racing’s primary competition was the Motorsport in Action McLaren shared by Corey Fergus and Jesse Lazare and CarBahn Motorsports’ Audi shared by Tyler McQuarrie and Jeff Westphal. Fergus qualified the No. 69 McLaren second overall, but had his times stripped after the car weighed in light by half a kilogram (roughly 1.1 pounds) after qualifying. As a result, Fergus had to charge from the rear of the class. Holton led without challenge until he made his second pit stop on Lap 45, nearly two hours in. At that point, Wittmer got in the car and gave the advantage over to Fergus. A caution flew shortly afterwards, forcing Fergus to pit and allowing Wittmer to get back in the lead. However, he was pinged for jumping the restart. With so many on track issues, another caution flew before he could be assessed the penalty. Wittmer’s penalty put Westphal in the lead, but Lazare was able to get past on a restart to take the advantage back. Another caution right after Wittmer served the penalty kept Compass Racing in touch with the pack. Once Holton got back in the car on the final stop with 22 laps to go, Holton charged hard. His best lap was at nearly pole speed as he knifed through the field. A late yellow allowed him to close up on Westphal, who had pitted three laps earlier and was tight on fuel. Holton then pounced on Westphal as soon as the green came out (completely legal) and took the lead with six laps to go. From there, he pulled away to take the win. Motorsport in Action was set for a second-place finish, but the No. 69 McLaren (which pitted one lap before the Compass Racing No. 75) burbled on the last lap. That allowed Automatic Racing’s Kris Wilson to get past. The two cars were in a drag race to the line that Wilson and teammate Gary Ferrara won by only seven-thousandths of a second, nearly seven seconds behind Holton and Wittmer. BimmerWorld Racing’s James Clay and Devin Jones finished fourth, 12 seconds back in their M4. Multimatic Motorsports’ No. 22 for Chase Briscoe, Austin Cindric and Billy Johnson was fifth. Winward Racing/HTP Motorsport’s Indy Dontje and Russell Ward were sixth, followed by Park Place Motorsports’ Alan Brynjolfsson and Trent Hindman. Nolasport’s Jason Hart, Matt Travis and Mike Vess were eighth, while the second Multimatic Ford of Majeski, Cole Custer and Scott Maxwell was ninth. PF Racing’s Jade Buford, Patrick Gallagher and James Pesek was 10th. Westphal was forced to pit coming to the white flag for a splash of fuel and ended up finishing 16th. TCR ended up being a race of attrition. Early on, the cars to beat were the pole sitting JDC-Miler MotorSports Audi of Michael Johnson and the eEuroparts.com ROWE Racing No. 10 Audi of Lee Carpentier. The two drivers swapped the lead a couple of times and were racing hard just after a restart when contact was made entering the bus stop chicane. The result was that both cars spun and hit the SAFER Barrier, bringing out another caution. The crash eliminated both cars from the race. Much of the race was a free-for-all with half the class in contention for glory. Slowly but surely, the pack was whittled down. First, both of the Hyundais had issues. The No. 21 was down on power and off-song. Meanwhile, the No. 98 with Michael Lewis at the wheel hit the HART Honda No. 89 of Ryan Eversley, ending HART’s day. The No. 98 eventually retired after additional damage. Alex Popow in the No. 3 Alfa Romeo Giuletta TCR was in very good position to win. Unfortunately for KMW Motorsports with TMR Engineering, terminal problems developed under the hood, forcing the team to retire late. The Alfa retirement resulted in a three-car race to the finish between LA Honda World Racing’s No. 37 of Shelby Blackstock and Tom O’Gorman, their No. 73 of Mike LaMarra and Mat Pombo and the Fast MD Racing No. 23 Audi of Nick Galante, Jared Salinsky and James Vance. As the laps wound down, O’Gorman was just far enough in front of Pombo that Pombo could not catch his draft. As a result, O’Gorman was able to hold on to take the win. The margin of victory was 1.605 seconds over LaMarra and Pombo. The Fast MD Audi ended up nearly six seconds back in third. Atlanta Speedwerks’ Brian Henderson and Todd Lamb ended up a lap down in fourth, their challenge derailed by having to nurse a flat tire for three miles back to the pits. The No. 21 Veloster of Harry Gottsacker and Mason Filippi actually finished fifth in class, but retired four laps short of the finish. Today’s four-hour race will air in highlighted form on NBCSN Feb. 6 at 1 p.m. Michelin Pilot Challenge teams will have the next six weeks off before returning to action at Sebring International Raceway. That race, the Alan Jay Automotive Network 120, will be held on Mar. 15.
this race was just ridiculous,only a few brands were competitive the rest of the field was just there for show.the Mclarens and maybe the Audi’s far outclassed the rest if the field .sorry i spent even 40.00 to watch only part of this race.I left only after 2 hours.